With this course I take you through the elementary stages and up to the creation and preparation of a full dinner including a number of courses, either for a party or buffet. Because the course covers 6 hours, there is ample time not only to learn, but also to create a wide range of interesting dishes, and this can be reflected in your final choice of menu. The options include preparing a large buffet or a full dinner of 7 courses including soups, entrées, salads, seafood, fish and meat dishes (or vegetarian) with garnish, and deserts. Or if you are interested in other cuisines, how about a range of tapas, meze, or indian dishes? We can develop the menu together, so get inspired! 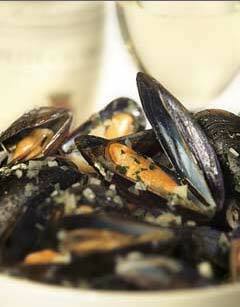 A classic dish such as Moules Marinieres, with shallots, fresh herbs and white wine, can be prepared in minutes.